I would like to thank the Wildwood PGO for funding our author visit with Lisa Bunker. Our time with Lisa Bunker was truly inspired. I felt very lucky to be a part of this extraordinary experience. 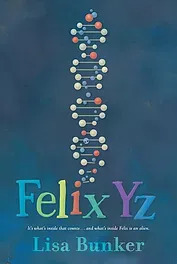 Chris Eggemeier had groups of 6th graders read her first novel, Felix Yz, in small groups and I read it to a lunchtime 5th grade group. Our students were thoughtful readers of this science fiction story about young Felix who counts down the days until he is separated from the 4th dimensional alien that inhabits his world. All of our students came prepared with insightful and challenging questions for Ms. Bunker and the conversations they had as a result were fascinating. Lisa was very open and honest about her experience as a writer and her journey to become an author. I have been a librarian for 12 years now and I have been fortunate to arrange many author visits. This visit with Ms. Bunker was the best visit I have been a part of to date. Our students were prepared and inspired. They brought a sincere interest and appreciation to the experience. Ms. Bunker was so real and approachable. Her sincere interest in what her readers thought and who her fans are as young people was refreshing and truly appreciated. It was an exchange that I will not soon forget. There are many people to thank because a visit like this takes the support of our administration, the funding of our PGO, and willing teachers who support our students meeting local and diverse authors so that our students can see themselves in the books they read and the authors they meet. Thank you Nick, Ms. Felix, our generous PGO, Chris and the 6th grade team, the 5th grade teachers, and Jenny Haugsjaahabink who covered my library classes during the visit. Thanks, most of all, to our enthusiastic students who, without fail, say "YES" to new experiences and books! Follow Lisa Bunker (www.lisabunker.net)! Her next novel Zenobia July is scheduled to be published in 2019!